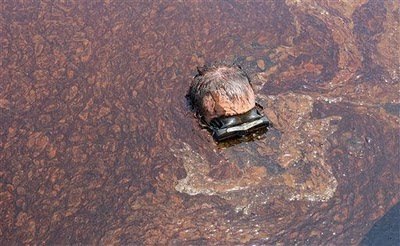 Here is a first hand account and pictures to go with it of AP reporter Rich Mathews swimming in the oil spill. Nice work Rick! To see the full story check it out at the AP. "Some 40 miles out into the Gulf Of Mexico, I jump off the boat into the thickest patch of red oil I've ever seen. I open my eyes and realize my mask is already smeared. I can't see anything and we're just five seconds into the dive. Dropping beneath the surface the only thing I see is oil. To the left, right, up and down _ it sits on top of the water in giant pools, and hangs suspended fifteen feet beneath the surface in softball sized blobs. 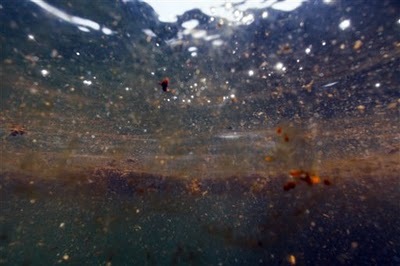 There is nothing alive under the slick, although I see a dead jellyfish and handful of small bait fish. I'm alone because the other divers with me wouldn't get in the water without Hazmat suits on, and with my mask oiled over and the water already dark, I don't dive deep. It's quiet, and to be honest scary, extremely low visibility. I spend just 10 minutes swimming around taking pictures, taking video. I make my way to the back of the boat unaware of just how covered I am. The oil is so thick and sticky, almost like a cake batter. It does not wipe off. You have to scrape it off, in layers until you finally get close to the skin. Then you pour on some Dawn dishwashing soap and scrub. I think to myself: No fish, no bird, no turtle would ever be able to clean this off of themselves. If any animal, any were to end up in this same puddle there is almost no way they could escape. The cleaning process goes on for half an hour before the captain will even think about letting me back in the boat." Rich is serious about his work. You can't beat that 1st hand experience. Good post - thanks for sharing.